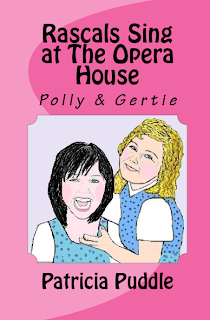 Rascals Sing at The Opera House is now available as a paperback on Amazon books. I had to hurry and write this story because some of my favourite fans kept asking for the sequel to Star-Crossed Rascals. I hope this book makes them laugh as much as the first in the series, and I already have a plot for the third book. But first, I have to finish the sequels to Velvet Ball and Molly Gumnut. I can't have Molly and Velvet getting jealous of Polly and Gertie because I'd never hear the end of it. I had so much fun writing this story, but even more fun drawing the illustrations, though they took me forever. And to think five years ago, I didn't even know where commas went or how to spell. Now I've self-published four children's books as well as drawn my own illustrations and written songs and poetry for all my characters. This book is dedicated to all those children out there that struggled to learn like I did. And for all those kids that had embarrassing accidents at school like I did. You're never too old, or too young to learn anything. Follow your dreams, children and pay attention in school. And if your teacher won't teach you, turn her into a wicked witch in your book. LOL. This book was inspired by the things that happened to me as a small child at school. Here is a photo of my very first classroom and in it sits my best friend. Unfortunately, I can't bee seen in this photo as I was probably at the other side of the classroom, but I'll post a picture of me below. My best friend is sat at the table on the top left. She's the girl with a bow and pointing at a reading card. She's sat next to the little boy with blonde curly hair. My best friend inspired Gertie, and yes, we really did go to a singing festival and I really did have to mime. My voice was horrible, but I so loved to sing. I was only allowed to stay in the choir if I promised to mime. Which I did, but I got into trouble from my teacher for wobbling my head like an Opera Singer. She said I was over acting. Though it wasn't the teacher from kindergarten. That teacher was wonderful, it was a later teacher. I also really did stink out the classroom, but to find out how, you'll have to read the book. 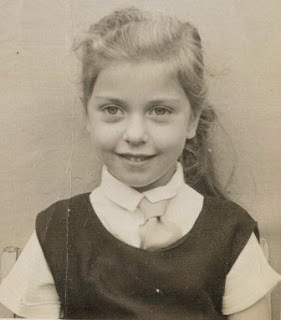 This is me as the rascal who inspired Polly. Labels: Rascals Sing at The Opera House now available as a paperback. This book sounds great! Congratulations! Thanks Lindsey. I'n so tired after doing all the illustrations. LOL. The story was a breeze compared to the drawings. This is one AWESOME book! The kids and I adored it! Thanks for visiting my blog, Intricate Knot, and thanks for the compliment. cheers. Thanks Chrissy, I'm so happy that the kids like this book. I love to get feedback from children.